Material : Linen with silk embroidery. Made in Duxbury, MA, c1653. Descended in the Standish and Alden families. 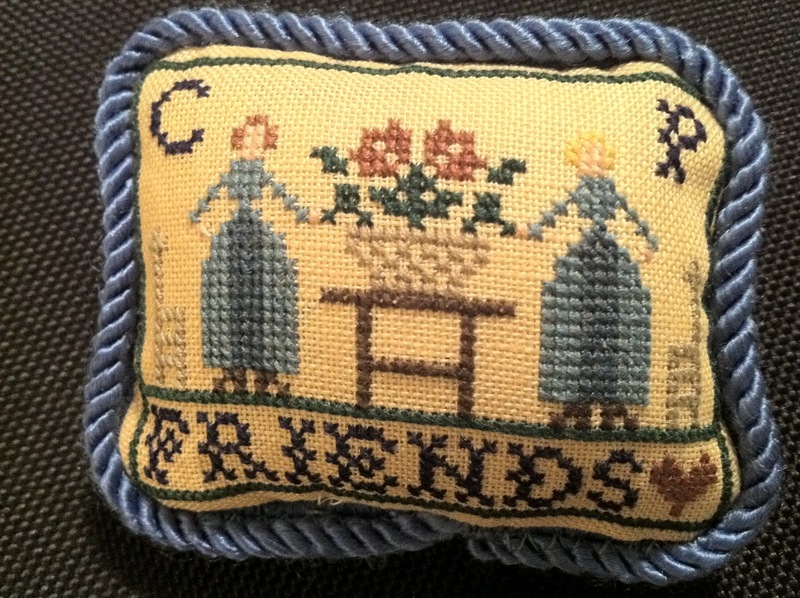 Loara Standish, daughter of Captain Myles Standish, is thought to have made this sampler in her teens. It is the earliest known American-made sampler and the earliest known sampler with a verse. Samplers of the 16th to mid 18th centuries served as permanent records of stitches and designs, intended for reference, unlike later samplers that were planned for display. 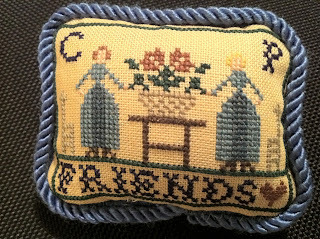 American samplers followed the British form, as instruction in needlework passed from mother to daughter. The glory to thy name"
This band was a bit confusing because the directions called it a long Arm Cross but the diagram looks more like an upside down Montenegrin stitch. I love the Long Arm Cross stitch more than the Montenegrin so I was torn which to do it as. Following the diagram it crosses over several stitches a couple times and looked bulky to me but I think this was so the back came out ok. This was not an important point to me since I was doing the non-reversible anyway. I ended up doing a regular long arm cross and liked it the best. Haven't posted an update for a while. I am working on it simultaneously with the Loara Standish sampler. (among other little things). The chart says count down 6 threads but I figured that is where you begin the next stitch below. Not 6 stitches between rows at least not what I could tell from the picture. I put 3 threads between row 1 and 2. The fabric came in the kit and it 35ct so the finished sampler won't be as small as the original which was stitched over 50 ct. Band One was pretty easy. Called the Standish stitch. A wonderful member of the Sampler Guild of the Rockies passed away last month and in her memory a rose motif was designed in her honor. I stitched this over 1 on 40 ct Examplar linen and mounted it to the top of a tape measure.